Displaying image 358 of 363 images in Astronomy. 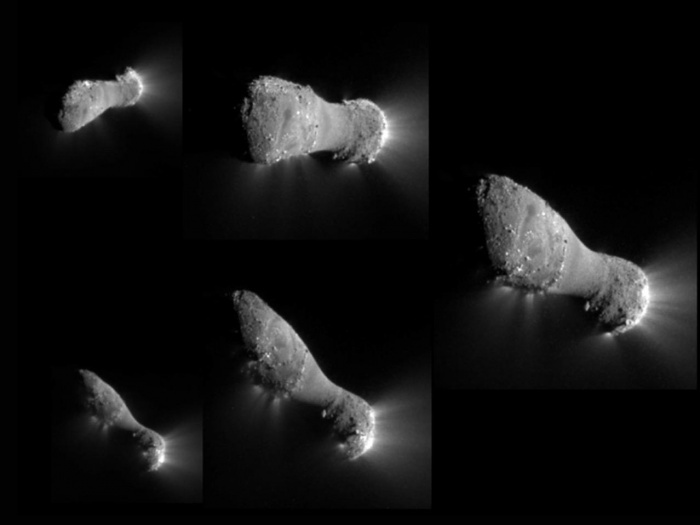 Explanation: Follow these 5 frames clockwise starting from the top left to track the view from the EPOXI mission spacecraft as it approached, passed under, and then looked back at the nucleus of comet Hartley 2 on November 4. Its closest approach distance was about 700 kilometers. In fact, this encounter was the fifth time a spacecraft from planet Earth has imaged a comet close-up. But Hartley 2's nucleus is definitely the smallest one so far, its long axis spanning only about 2 kilometers (1.2 miles). Though Hartley 2 is small, these stunning images showing jets of dust and gas indicate an impressively active surface. The jets are seen originating from the rough surface areas, with sunlight illuminating the nucleus from the right. Remarkably, rough areas at both ends of the elongated nucleus are joined by a narrower, smooth waist. The EPOXI mission reuses the Deep Impact spacecraft that launched a probe impacting the nucleus of comet Tempel 1 in 2005.